In the past year I’ve interacted on a personal level with several people who bring Buddhist principles to the office. Each of them have told me their goal is to treat all people equally. As a manager, it’s driven by a desire not to appear to give preference to someone, or to look like they’re playing favorites. On the surface this seems like a brilliant idea. But here’s how it made me (and many others I know) feel: unheard, unseen, unvalued, unappreciated, unimportant, average and just-like-everyone else. In the workplace, we have all kinds of people. Some need pressure to perform; others wilt under it. Some employees need to be heard and acknowledged by their boss, while others need little to no recognition to feel they’re part of the team. While I understand the desire to treat people equally, I can clearly think of instances where the same event and set of circumstances was seen positively by one person, neutral by another, and negatively by a third. This got me to thinking about what started to feel like a very related concept: praise. In particular, how to successfully and mindfully give and receive praise. Because I know I perform better when my hard work and efforts are acknowledged and thanked, this is a topic that I have put much thought into over the years. In fact, when I was working full time, I had a directory in my email inbox labeled “ILM” which stood for “I Love Me”. I would file away any emails that I received offering thanks, expressing gratitude, or that generally gave me a warm fuzzy feeling, and when I was having a rough day, I knew I could go and peruse those emails to help bump up my self-esteem. When I left my full time job last year, I looked in my ILM directory. The last email I had added to that directory was from a year and a half previously. 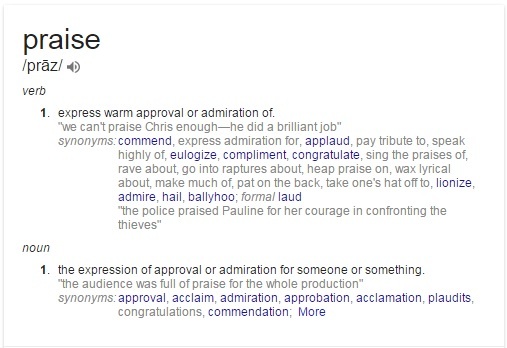 To express warm approval sounds pleasant. I even found an article focused on the benefits of Giving Praise. In particular, it points out that recognition and praise can outrank base salary in importance to an employee. Fairness: knowing that leaders ensure equal and fair distribution of rewards. Following down the rabbit hole, I went back to the definition of praise looked up the definition for admiration, which lead me to define appreciation, which lead me to define recognition. In particular, acknowledgement of something’s existence resonates deeply with me. “I see you. I hear you. I recognize you.” What profound statements. I found another article, The Power of Positive Employee Recognition, that asks the question, Why is Recognition so Scarce? In my experience, employee recognition is scarce because of a combination of several factors. People don’t know how to provide employee recognition effectively, so they have bad experiences when they do. They assume that one size fits all when they provide employee recognition. Back to the “treat everyone equally” mantra. The solution posited is simple: ask what makes an individual feel rewarded. Remember that employee recognition is situational. Each individual has a preference for what he finds rewarding and how that recognition is most effective for him. One person may enjoy public recognition at a staff meeting; another prefers a private note in her personnel file. The best way to determine what an employee finds rewarding is to ask. For me, quilting is rich in a level praise and recognition that makes me feel deeply rewarded. Quilts get used and snuggled and loved. I sleep under quilts I made every night. Occasionally I get to see others using my quilts. I also have the privilege to interact with a vibrant community of other quilters (you!) who can answer questions when I am stumped, donate their time, fabric, and sewing skills, and who I enjoy having conversations and discussions through blog posts like this. What makes you feel rewarded and motivated? Do the same things that make you excited to quilt resonate back to other areas of your life? Filing away special, positive emails is actually pretty fun. I have started to do a similar thing with positive customer feedback on my quilts. I think I prefer a bit of recognition over a heaping pile of praise (I tend to prefer things more one-on-one than in front of large groups, too), and I think that something as simple as a thank you can be more important to someone than we might realize. It’s been almost 7 years since I last had a regular paying job, but I do remember getting the praise and recognition that I needed to feel good in the position. About 6 months later I was used as a scapegoat and “fired” from the volunteer position I had kept up after the grant money ran out. I think motherhood is difficult for me because there is such a huge lack of recognition and praise and an over abundance of second guessing, self criticism and frustration. I think that was a big reason I got into quilting–I started just after leaving the volunteer job and I was pregnant with Arden, and we had just moved to the mountain house and I was very isolated and alone most of the day. Quilting was a slow start for me, but I got a lot of praise and recognition for a finished quilt. The third quilt I ever made was a wedding gift that was well received–and that was the tipping point, I think. Quilting became a full time hobby that gave me the gratification, praise and interaction with people that I need. I’ve felt the rewards of the community as I’ve become more involved in it. I love the praise and support I get from online friends! I’ve been thinking about it a lot this week being off of IG–I miss the interactions I get there daily, the support and encouragement and having so many people genuinely commiserating over ripping out a billion stitches. Also I’ve been thinking about how Aurifil has really built a strong and loyal customer base, partly on a good product and partly on recognition–who doesn’t love seeing their quilts displayed on their FB page?? Quilting really is full of lots of wonderful qualities, and knowing I am making something useful and functional is also enough to keep me really excited. What a great point about Aurifil – yes, I love getting to see my friend’s quilts featured by them (and mine on occasion, too)! It really is a brilliant strategy. I find it is hard for me to accept praise, but I do like getting it. Weird I know. I find positive rewards in quilting different from praise. I love the feeling of accomplishment when I finish something, more than in another aspect of my life. I love the sense of joy I get from just playing/petting fabric. And I love the feeling of warmth (in my soul) that snuggling under a quilt gives me. But all of those are internal praise things. I find it harder to accept from others. But I have learned that it is important to say thank you, to everyone for even the most minor things. It is good for the other person, but it is also good for me. I don’t think it is weird at all, Shauna. I think our society has a stigma around gratitude and praise, and if we aren’t taught how to be comfortable receiving it, I think we are more likely to feel uncomfortable because it is more likely we have been taught it is to be avoided. 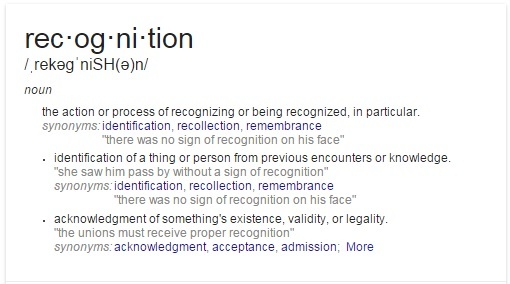 I guess I am personally still struggling between the distinction of recognition, praise, and thanks. I think that a simple thank you can go a really long way, as you mention. I think it is quite possible to treat everyone equally and still praise them. Everyone wants to be acknowledged for what he or she has done. Simply recognizing each person’s efforts and achievements can go a long way to getting more of that type of behavior from someone. Well, I’ll tell you from personal experience that part of treating everyone equally was the thought that recognition or praise could also not be doled out unless everyone got it… but, that was just one take on it. And you are so right, simple recognition means a lot. What an interesting discussion. I agree that we are all individuals and take things in our own way. I also like seeing the difference between praise and recognition. Quilting helps me in so many ways. I love the feeling of accomplishment when I finish something. I enjoy compliments. But what means the most is when what I have done is used and loved–whether it is a quilt or an idea I shared. Yes, seeing a quilt used and loved is exciting. And I like that you mentioned seeing ideas that you have shared being used – being a teacher has great rewards, too, if you have the right mindset! I know praise is really important, and it’s something that is very clear with children, but I don’t think it’s something I particularly need. Although I definitely don’t enjoy feeling taken for granted and a thank you is always appreciated! But what makes me feel motivated and rewarded would have to be achieving goals, seeing an end result or a difference I’ve made. I feel like I reached a point in my life quite a while ago where I know whether what I’m doing is worth it or not, and generally that’s what matters now! It’s funny, though, because I am approaching the 1 year anniversary of my big lifestyle change and I have found that recently I have become pretty worried about the fact I don’t make any money at all. I’ve found myself considering applying for part time jobs around town, even though I don’t have any interest in the jobs themselves.